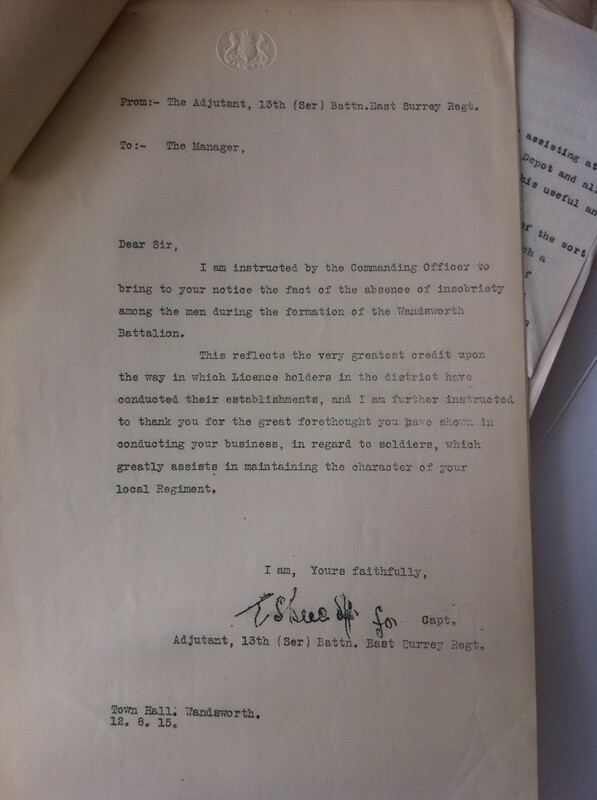 The Wandsworth Recruitment Committee met on 20th August, to a report from the Mayor that the Battalion would, in all probability, be taken over by the War Office in the next day or two. The War Office did not provide for the provision of bands for Service Battalions, so the Mayor has purchased the necessary instruments and the musicians in the regiment had undertaken the relevant duties, turning out a very successful band. At the previous meeting the Mayor had reported on attempts to get the War Office to agree to a modified Cap Badge design, he had now had these authorised and would be able to supply them shortly. 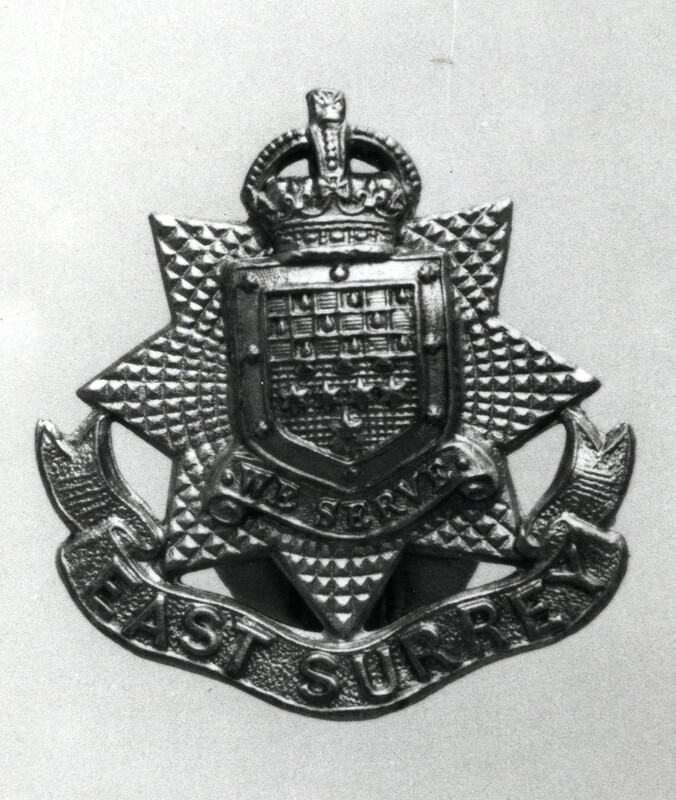 The standard badge of the East Surrey regiment had the coat of arms of Guildford on it, Mayor Dawnay’s proposed version had the Wandsworth coat of arms and the borough motto “We Serve”. Farewell Route Marches had already taken place, with Putney and District on 18th August, Clapham and Balham on the 19th, Streatham and Tooting on the 20th and Wandsworth still to come on Saturday 21st. The Wandsworth Route March was to include a Tea and Send-Off before the march, which would go from the Drill Ground, Buckhold Road, past the Town Hall, Wandsworth High Street, Broomhill Road, Merton Road, Penwith Road, Earlsfield Road, Windmill Road, Trinity Road, Huguenot Place, East Hill, High Street and Buckhold Road to the Drill Ground. The public were invited to the Drill Ground and handbills had been circulated by the boy Scouts along the route. One of these handbills is in the Battalion correspondence file, asking residents to put up decorations and give the Battalion a resounding send-off. As the Battalion was recruited and ready to do, this was the final meeting of the Battalion recruiting Committee and there are various summaries and accounts pasted in to the volume. 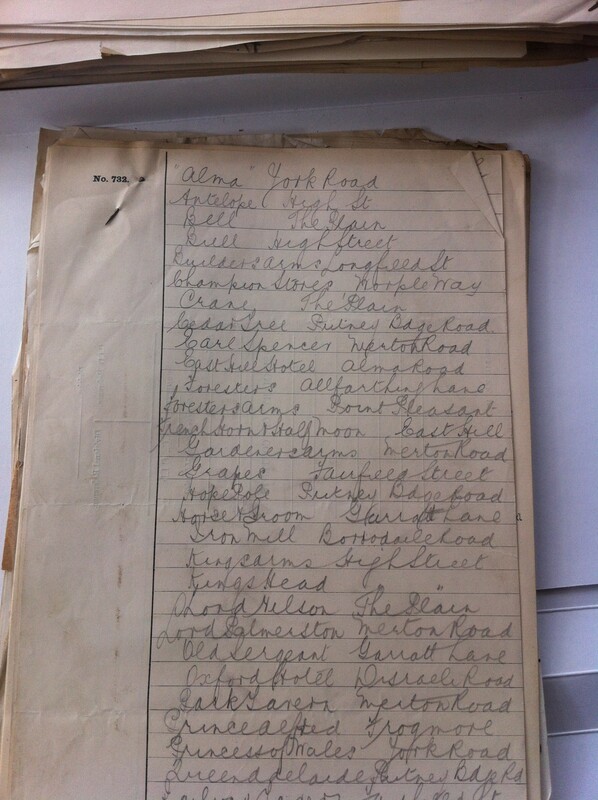 A list of subscriptions given for the Battalion includes a lists of names and amounts given, with “List 5” stating the total donated by local people as £862 16s 5d. Amounts range from Sir William Lancaster giving £10 10s (his second donation) to a Mrs Hatfield giving 2s6d. By List 6 the total was £1224 16s 11d and by List 7 it had reached £1251 9s 3d, including the Mayor having given a second donation of £200 and a third of a further £100. 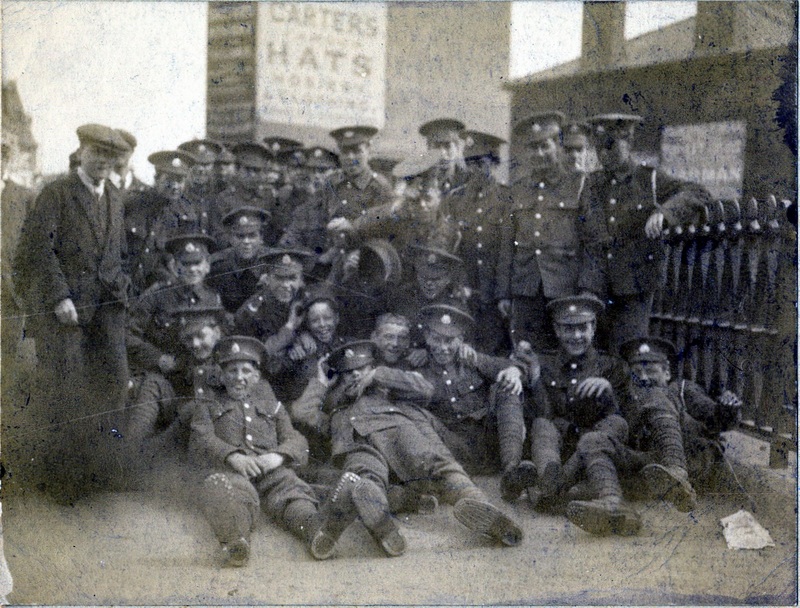 The summary states that the War Office authorised the Mayor to raise a Battalion 1350 men and 36 officers, all Wandsworth men, in May and recruiting had commenced on 28th June. 10 recruiting offices had opened, with the very first recruit being an employee of the Council. An additional company had been raised for Depot purposes, bringing the full strength of the Battalion up to 1600 men. 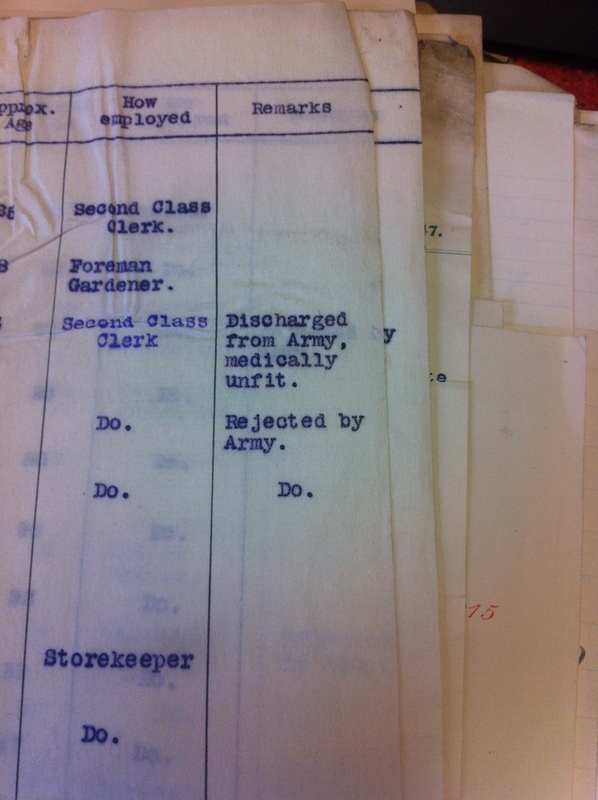 57 of the 230 applications for commission were nominated and 32 approved and gazetted by the War Office. 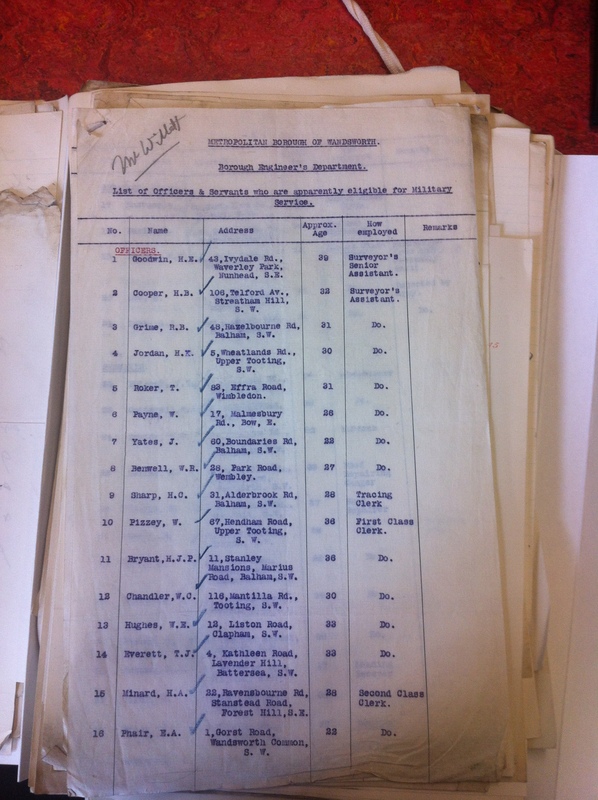 The correspondence file includes some details of those who applied, although only the first twenty or so rather than the whole 230. The summary in the minutes finishes by noting that 113 Battalions had been authorised by the War Office to be raised by individuals and organisations, but Wandsworth held the record in completing a Battalion in such a short time. A full history of the Wandsworth and Battersea battalions, written by Paul McCue, is available for loan from Wandsworth Libraries. Recruitment continued across the borough this week, the Tooting & Balham Gazette carried an advert encouraging the men of Wandsworth to “Enlist at Once” and “Don’t Delay”. Cautiously, it was advertised as being for Three Years or Duration of the War. The paper also reported several successful recruiting meetings being held, including on both Tooting and Wandsworth Commons. The Tooting Common meeting was due to have been addressed by Corporal Dwyer, the youngest VC in London, but the large crowds were disappointed as he was recalled to his depot the morning of the meeting and not granted permission to attend. Such meetings were not the only methods being employed to encourage recruitment, a meeting of ladies resident in the Borough had been held at Wandsworth Town Hall to organise women to encourage eligible men to join up. The meeting was attended by the Mayor and Mayoress, with Lt Col Burton there to explain the scheme. The effects of recruitment were clearly being felt across the borough, according to the other stories reported in the paper. Staff employed by Wandsworth Borough Council were being told that the depletion of staff meant that no holidays were to be granted this year. Instead, men were to be paid extra wages. The Wandsworth Officers and Servants Committee, which took care of staffing matters, does not refer to this in its minutes for June and July 1915, being more taken up with temporary appointments and how to deal with the pension contributions of employees killed in action. Presumably an action such as refusing holiday and increasing pay instead would have been decided by the Committee or the Council, so perhaps the newspaper was mis-reporting the decision not to give holiday pay to employees on active service. This week also marks the centenary of the unveiling of the clock at Tooting Library and the memorial plaque to Rev J H Anderson. Rev Anderson had been rector of St Nicholas Tooting and a local councillor, including having been Mayor of Wandsworth in 1904. He died in 1913 and it was felt that he had made such a contribution to the area that there ought to be a permanent memorial to him – public subscriptions were collected and the clock made by Gillett & Johnston of Croydon, to a design by W & E Hunt, architects. The clock and tablet were unveiled by Sir William Lancaster, the donor of the library and also a former Wandsworth mayor, with speeches from Councillor A J Hurley (also the proprietor of the Tooting and Balham Gazette, and perhaps the reason why the unveiling is so well covered), the current Mayor Archibald Dawnay and Rev Anderson’s son. 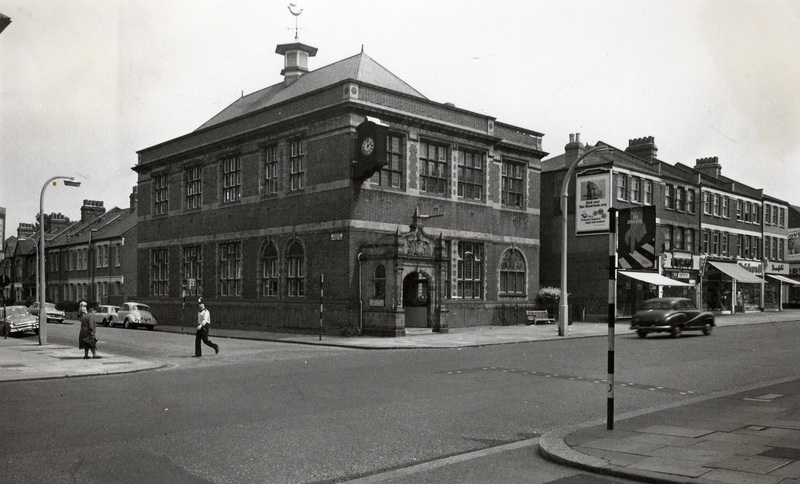 The clock is clearly visible in this 1960s image of Tooting Library.